You may have heard the statistic that 50% of small businesses fail within the first 5 years. That’s true - but 50% succeed too. And you’re in this successful group of start-up stars. That means you’re probably already thinking about expanding your Oklahoma small business. It’s the natural next step, after launching a profitable company. 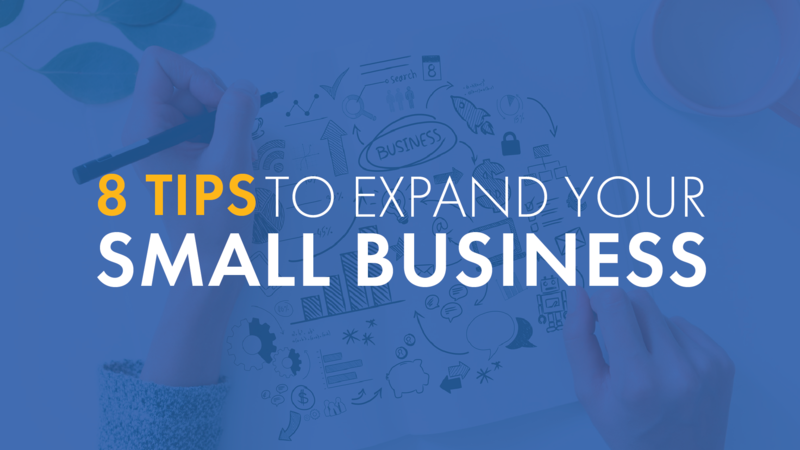 Here are 8 ideas for expanding your small business into a bigger operation. One effective way of expanding a business is to make a conscious decision to either focus in on a specific niche, or diversify more widely. Either method can offer big opportunity, depending on your specific market and situation. To focus in on a niche, look for opportunities your competitors are missing. Is there an aspect of your business where many customers are unserved or underserved? Or is there something you’re already doing much better than the competition? Dominate the market in this area. Or take the opposite approach and diversify. If many of your competitors are extremely focused on a narrow aspect of the business, offer more diverse products or expand the services you provide. This will encourage more customers to turn to you in the future, for a variety of needs. When you’re eyeing expansion, it’s the perfect time to update your marketing plan. Investigate new marketing opportunities, like inbound marketing, search engine optimization, and social media messaging. If these ideas are unfamiliar to you, reach out to an Oklahoma small business coach who can help you explore these ideas. A marketing consultant can also offer fresh ideas that will assist in your expansion. Have you looked into international options that would help you expand your business? Perhaps you could offer services in another language, or develop a product for a specific country. Exports can also provide huge opportunity. Before expanding internationally, you’ll need to ensure you can meet all international regulations, privacy laws, and tax laws. Partner with an accountant, financial advisor, or Oklahoma small business coach who can guide you through this tricky territory. An influx of cash can also allow an expansion that wouldn’t be possible otherwise. There are numerous ways to seek new funding, some better than others. A bank loan is a classic way of getting financing for a business expansion. You can also establish a small business line of credit or set up a credit card account for your business - although the interest charged can be steep. Some business owners seek financing through angel investors, or affluent businesspeople who provide loans in exchange for part ownership. You could even try crowdfunding, where a website is set up to gather donations or investments to help your business. New technology is expensive, but it can help you expand by leaps and bounds. If your competitors can’t offer the same advanced equipment and services you provide, it will make all the difference in the marketplace. Before investing in technology, look at your financial picture and educate yourself about the pros and cons of the purchase. Buy only as much new tech as you can afford, and beware of add-ons and support packages that could make the total spend much higher than anticipated. Partnerships, mergers, and acquisitions are another way to expand. Is it possible to buy out a competitor and continue in the marketplace as one larger, stronger company? Many small businesses use buy-outs to expand quickly and build their customer database. Strategic partnerships can also provide new opportunities. Find a company that complements your business, and talk to them about a mutually-beneficial partnership. Offer a strong referral program between your companies, so you’re always the first choice when someone needs a recommendation. No matter which expansion approach you take, you’ll need to make sure you handle the details correctly: payroll, revenue, expenses, investments, accounts receivable, taxes, and much more. You also don’t want to miss out on things like tax deductions that could be saving you money. An accountant can take care of many of these individual things for you, or you can seek out an all-in-one accounting service that handles everything for a flat monthly fee. It’s a good way to ensure all your bases are covered, without letting costs get out of control. Expansion strategies need a careful, thoughtful approach. An Oklahoma small business coach can help you look at the big picture and develop a step-by-step plan for expansion. Ascension CPAs & Consultants can help you navigate an expansion smoothly. We can also reduce the tax burden you face and provide business consulting with a personal touch. Call 405-759-2796 or use our contact form for a free consultation.